5 June 2015 | Brazil holds more than 12 % of the world’s freshwater, but citizens in some parts of the country – most notably Sí£o Paulo – have been suffering unprecedented drought this year – in part because of a failure to appreciate the linkages between forests and water supplies. That failure, however, has led to a renewed appreciation of the interlocking services its vast natural resources provide: the carbon that its forests keep locked up as they regulate water and the thousands of species of plants and hundreds of species of birds and freshwater fish in its Canada-sized Cerrado, among others. The Brazil Ecosystem Services Matrix lets users track ecosystem service programs across all of Brazil.. The country is also home to thousands of programs that use payments for ecosystem services (PES) to fund conservation by recognizing the value of those services. In Brazil, the best-known form of PES is REDD – an acronym for programs that conserve endangered forest by harnessing carbon finance to “Reduce Emissions from Deforestation and Degradation”, but the most advanced programs cover water – often by restoring forests that regulate rivers. For such programs to deliver on their potential, decision-makers have to know what works and what doesn’t – but until recently, that information was scattered in isolated pockets across the country. It changed last week when Ecosystem Marketplace publisher Forest Trends unveiled the Brazilian Matrix of Ecosystem Services (Matriz Brasileira de Serviços Ecossistíªmicos), with the support of Brazilian non-profit organization Fundo Vale and the Good Energies Foundation. The Matrix is a database of more than 2,000 PES programs across Brazil categorized by type: water, carbon, biodiversity, sustainable agriculture, livestock, and “multiple”. The “multiple” category refers to those that bundle several ecosystem services into one payment plan or embed the service cost into a product price such as certified timber. Fundo Vale first approached Forest Trends after seeing Ecosystem Marketplace’s Global Matrix, a similar database of ecosystem markets, but on a worldwide scale. The two organizations developed the Brazilian Matrix jointly over more than three years, with support from the Good Energies Foundation. 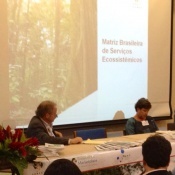 Beto Borges (left) introduces the Brazil Matrix of Ecosystem Services in Sí£o Paulo. Developers plan a second phase, which will include work with the Brazilian Biodiversity Fund, a non-profit organization, and possibly government ministries as well. Although designed as a decision-making tool for use within the country, the Matrix can also provide an opportunity for people outside the country to understand the country’s rich blend of programs – and not just the isolated few that have received international attention, says Borges. The Matrix was primarily created to fill the knowledge gaps and gain a deeper understanding of ecosystem services and the payment mechanisms meant to protect them. Developers of the tool intend to address issues such as social benefits, scale, effectiveness, challenges and opportunities. And with Brazil’s vast ecological assets combined with the country’s heavy involvement in innovative compensation programs, potential for PES is huge. In an early proposal document, Borges said these practices – PES – can drive significant investments for a true green economy that alters the existing paradigm which promotes development at the cost of the environment. As the landscape of ecosystem markets is constantly changing, an ultimate objective of the Matrix is establishing a roadmap for stakeholder engagement, according to the 2012 proposal document – which also describes the tool as a ‘living’ database that evolves with the market but its inclusive analysis can provide stability and guidance. The matrix creates a simple and direct way to visualize and follow global and regional trends of environmental markets in Brazil, the web page reads. Cristina Maria do Amaral Azevedo, Deputy Secretary of Environment for the State of Sí£o Paulo, said the initiative could reduce transaction costs and draw in the private sector. The information the Matrix provides offers a bridge between the public and private sectors. PES can harness private dollars for conservation in a sustainable way and fill the funding gap that exists currently as conservation activities are largely publicly funded. The Matrix allows for a healthy progression and incorporation of compensation schemes into land-use strategies and regulatory development, the booklet reads. The accompanying report was authored by environmental researchers Carlos Eduardo Frickmann Young and Leonardo Barcellos de Bakker, who note that PES doesn’t let government off the hook. Instead, they say, it requires strong environmental policy that supports sustainable development. Government must still enforce protection on protected areas as well as other environmental regulation, they say. The Matrix simply makes everyone’s role more visible and transparent. “The Matrix developed by Forest Trends allows not only the acceleration of the decision-making process, but also provides an opportunity for convergence between the private sector, the public sector and civil society,” said Walter Lazzarini, President of the Environmental Council at FIESP (Federation of Industries of Sí£o Paulo/ Federaçí£o das Indíºstrias do Estado de Sí£o Paulo). The matrix identifies strengths and weaknesses of existing PES projects while also analyzing synergies among the various entities and best approaches for them to work together. Comments streaming in regarding the Matrix note the growing belief that the tool could influence a more comprehensive national PES law in Brazil. The nation has an existing law that defines ecosystem services and mentions PES.